Exotic bright jewel tones displayed in this matching set. 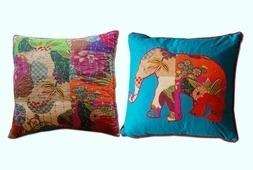 The first pillow has an all-over quilted design, and the second pillow features a centered elephant in coordinated prints on a teal background. Sold as a set.